Wood sorrel: Turning my garden into public grazing lands? Waiting for the school bus a couple of weeks ago, my neighbor’s son wandered over to a patch of weeds and plucked up a handful. The plant is high in vitamin C. It also has diuretic properties and is high in potassium oxalate and oxalic acid. Oxalic acid is a compound also found in grapefruit, parsley, broccoli, spinach, and many other vegetables. While it’s unlikely that anyone would consume enough wood sorrel to suffer any toxic effects from the oxalic acid, people with kidney disorders, rheumatoid arthritis, and gout should avoid consuming oxalis until they consult with a medical professional. Have I stumbled upon a new means of organic weed management? I envision herds of grazing children, replacing their favorite Sour Patch Kids with this weed that proliferates in my garden. More likely, I’ve found a new phenological cue: “When you see the children grazing, the sorrel is setting seed.” This reminds me that I had clearly better get to the weeding, unless I hope to find even more of the stuff in my garden beds next year. By the way, my daughter knows not to eat anything in the garden without first checking with me. Encourage your kids to check with you before eating wild plants–even if their friends do it. Here’s a terrific chart of common weeds, by the Missouri Botanical Garden. Get to know the weeds that make their homes in your garden. The more you know about them, including their life cycles and reproductive habits, the more weapons you have with which to thwart them. Hairy bittercress taking over a neglected patch in my garden. And please, avoid using chemical weed controls. They can be toxic to pollinators, including bees and butterflies, and can persist in the soil for very long periods of time. Mulch and other methods of weed control are more sustainable, and healthier for you, your family, your pets, and the environment over the long term. Continuing in my quest to learn my weeds, I am getting better acquainted with the most prolific of my weeds, Oxalis stricta, or wood sorrel. Copyright © 2005 by Robbin Moran, [ref. DOL15341]. This one is so common it’s almost difficult to see. It has a shallow taproot, but its extensive rhizome system also has lots of fibrous roots to support it. And those rhizomes go everywhere. Unlike the other weeds I’ve examined to date, this one is a perennial. It also is apparently difficult to control with herbicides, not that I like to go that route. So the best approach to controlling it seems to be to dig it up, taproot, rhizomes, and all, and mulch heavily after digging to prevent seeds from germinating. 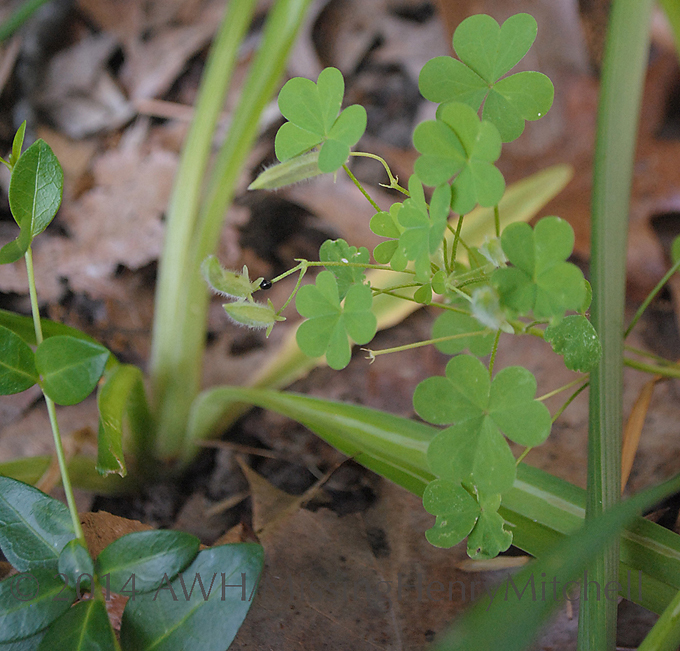 Growing up, we called almost anything with a three-part (tripartite–another Scrabble word) leaf a “clover.” But clover is a different plant from wood sorrel. How to tell the difference? Oxalis leaves are heart or spade-shaped and partly folded. Their leaf margins are smooth. 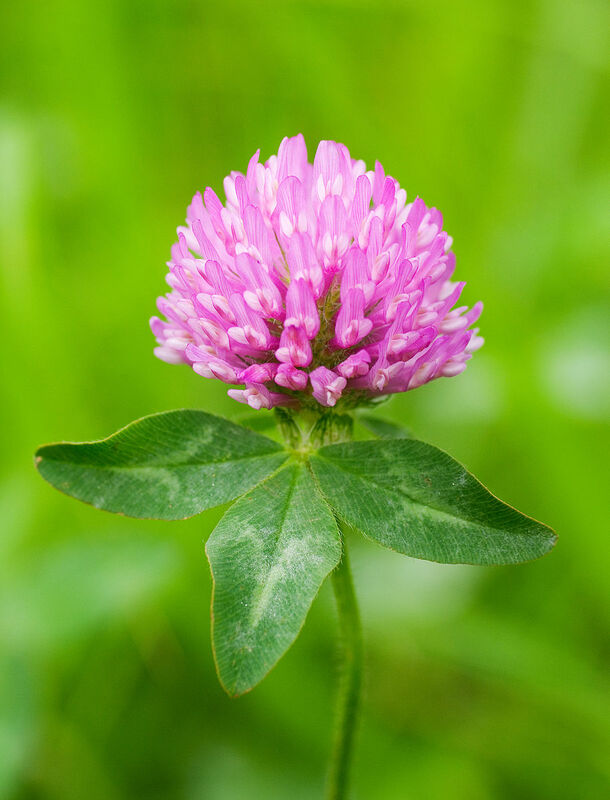 Clovers, on the other hand, have oval-shaped leaves with finely serrated margins and prominent veins. Oxalis species have five-petaled yellow flowers at maturity. Oxalis corniculata, or creeping woodsorrel, is a related perennial weed that grows low to the ground and roots where it establishes ground contact. Its leaves, shaped like other Oxalis species, fold downward in intense sunlight. When removing this weed, take care to dig the whole plant. If portions of the taproot or stolons are left in the ground, the plant can quickly reestablish. Last summer and fall, I endeavored to learn a bit about the weeds that persist in my garden, to better understand how to combat them effectively. One of the worst offenders in my garden is hairy bittercress, or Cardamine hirsuta. It is a rapidly growing winter or summer annual, which begins its life innocently enough as a petite rosette of arugula-like leaves. Overnight, apparently, it sends up a flower stalk, pollinates itself, and sets tiny explosive seed capsules that spring open when they are touched, flinging seed (the average plant contains 600, by the way) for what feels like acres. If only I were so resilient. On the way to the mailbox, I noticed a greenish mat in the midst of a stretch of mud. The knavish fellows are back, unthwarted by polar vortices, uncurbed dogs, and rapacious squirrels. But this year, I come to the battle armed with a tiny bit of knowledge (yes, indeed, a dangerous thing!). I know not to turn my back on these wolves-in-sheep’s-clothing of the weed world, or they’ll have propagated themselves before I can say “Well, [redacted].” I’m heading out this minute to pull these impish devils (they come up quite easily). And I shall add a generous helping of mulch in case their evil little siblings are getting ideas. Finally, I know who this fellow is, sort of. Acalypha…somebody, probably rhomboidea, commonly known as three-seeded mercury. He and his brothers are everywhere in my garden. 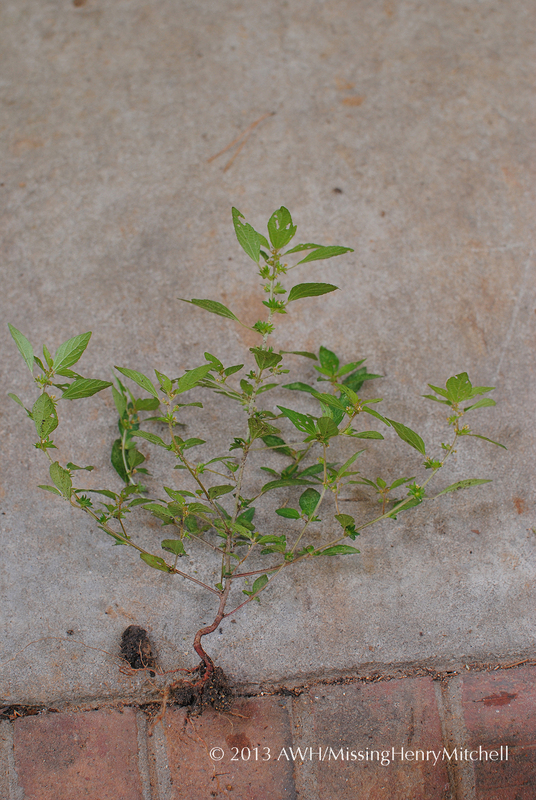 This annual member of the Euphorbiaceae family starts as a thin, erect reddish stem with narrow leaves, about an inch to an inch and a half long, arranged opposite along the stem. As it grows, it branches, and leaves are arranged alternately. Here is where my ignorance of botany is exposed:There appear to be small yellow flowers at the leaf axils, but those yellowish bits I see could be bracts, or technically it might be an inflorescence …anyway, if you care to read details about the plant’s structure, you can read the description from the University of Guelph extension, or the Wikipedia site. For me, right now, I know I’m fairly close to identifying the plant. This summer annual weed is not a nuisance, except that there’s a lot of it in my garden. It doesn’t reseed aggressively like hairy bittercress and it’s not difficult to eradicate. Despite the taproot, the plants are easy to pull. They are also said to be browsed by deer (not if there are phlox and hosta to eat, they’re not). 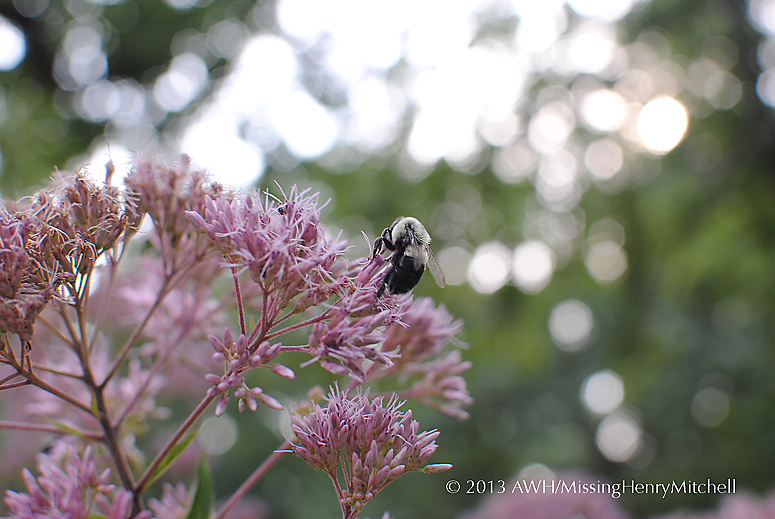 According to the Southern Living Garden Problem Solver, which may or may not have misclassified this as Acalypha virginica (my plant definitely doesn’t look like the one shown by Illinois Wildflowers.info), many insects love to feed on the leaves. Thus, my sample, with its raggedy, chewn leaves should be pretty typical. The seeds are supposed to be choice food for mourning doves, whom I would gladly welcome to my garden because I love their call. The buffet is open! 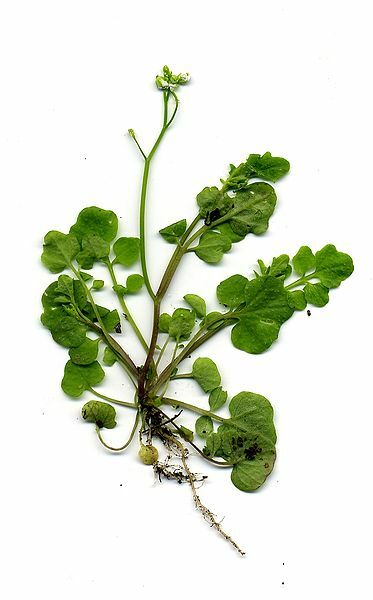 Continuing in my quest to learn my weeds, today I am studying hairy bittercress, Cardamine hirsuta. 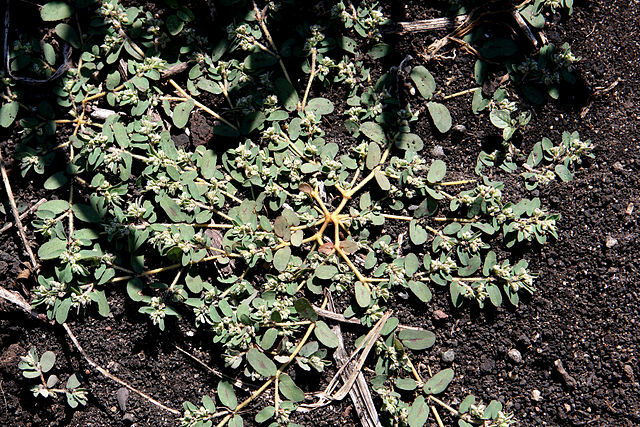 This is a photo of hairy bittercress in its less aggressive form (yes, dead; but I meant in flower, before the seed pods form). It is a winter or summer annual, depending on where you live. Perhaps in mild-climate areas, you are fortunate to have it all year round. The leaves appear in a tidy basal rosette, typically (for me) about 4 inches across. A single, neat, wirelike stem holds the tiny white flowers. Its innocent, almost dainty appearance may lull the gardener into deciding it can’t be that bothersome. Friend, be advised: Kill it immediately, and twice if you can. Sometime in the course of the summer, hairy bittercress loses its innocence; its mate is obvious. Its seeds form in a silique (new Scrabble word! ), which, of course, is Latin for “God-forsaken instrument of perpetual despair.” On an August afternoon, ambling through the garden on the way back from the mailbox, you may be tempted to do a light bit of weeding. You reach down for the spindly, twiggy wretch of a plant that you think, surely, must already have popped its clogs. You are just doing a bit of tidying. So at your gentle tug, you are shocked to hear a soft pop and witness a hailstorm of tiny seeds scattering in a circumference of astonishing size. You immediately enter the first of the five stages of grief: I didn’t just reseed this blasted waste of chlorophyll, did I? Ensleeve your arm with a plastic bag. Approach the target with the sensitivity of an explosive ordnance disposal tactician plying her craft. Pinch (or nearly pinch; now is not the time to detonate) the target (in this case, the stem) at its base. Invert the bag back over the target. Whether further measures must be taken to ensure eradication (setting fire to the bag, collecting resulting ash and encasing it in a lead box, escorting lead box to Yucca Mountain, etc.) is a decision only the gardener can sort out by weighing his wallet and his conscience. The local fire brigade may have an opinion on the matter. Or, the gardener can wait until next spring (or winter, or maybe just late fall), when it will bloom again, providing another Sisyphean opportunity. I listen to Margaret Roach‘s excellent podcast, A Way to Garden, and read her website of the same name. This year Margaret has been seeking to identify the weeds in her garden, to better understand their life cycles and ultimately get the upper hand on them. This is wise advice, and I am hoping to (gradually) acquire this knowledge of the plants in my own garden with which I wage perpetual battle. Today I am starting with an easy one: spotted spurge, known also as Euphorbia maculata or Chamaesyce maculata. 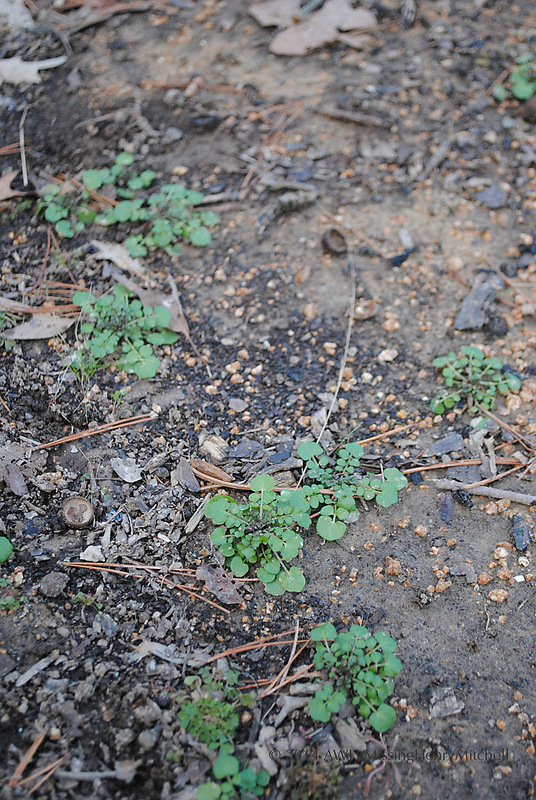 Although it grows from a taproot, I have always found spotted spurge fairly easy to pull up with a hand rake. But maybe this is my problem: Perhaps my technique yields the topgrowth, but part of the taproot remains, leaving a source from which it can regrow. Or my problem could be that I have a lot of it and don’t get around to eradicating it, so it multiplies. 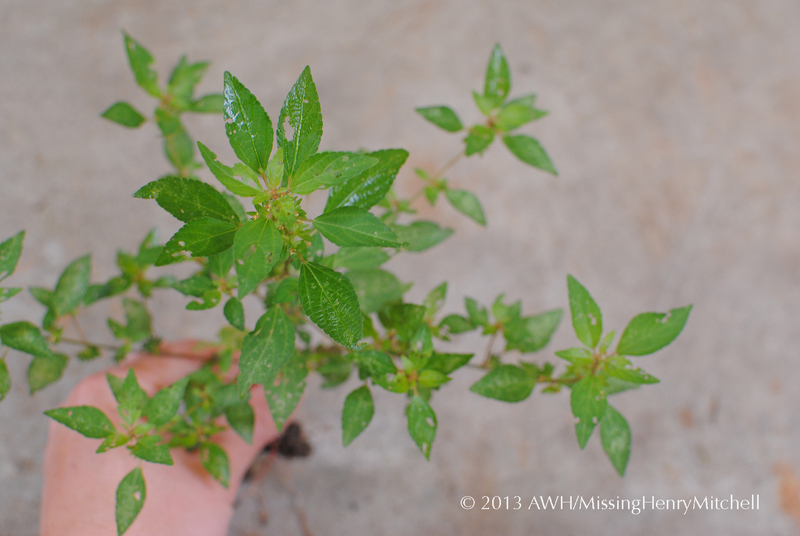 This is a summer annual weed, which means that if I can get to it early (and get that taproot! ), before it sets seed, I should be able to get it under control. It emerges in mid-summer, and can flower within 3 to 4 weeks according to NC Turffiles, so that time before flowering is the critical window in which I need to act. I fear the ship may have sailed, but I may still be able to row after it. Summer lasts a long time where I live. Also, like many Euphorbias, its stems contain a sap that can be irritating to sensitive skin. Must remember to get out the gloves. If you have spotted spurge in your lawn, you can help control it by raising the cutting height of your lawn mower. Higher-standing grass cuts down on the amount of light reaching the weed seeds in the soil. As it happens, I don’t have a lawn to mow. But I do have plenty of spots that could use a good top-up with mulch, which is also an effective control.